The newly designed Outlander Full Platform Exterior Lift features an on/off key switch, a toggle switch for up and down, a puddle light and an integrated license plate bracket. Easy drive-on loading from either end of the lift takes the hassle out of loading your scooter in a busy parking area. Simple hitched -based installation requires little to no modification to your vehicle and allows for easy removal. 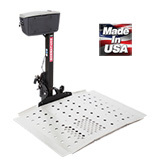 Maximum Mobility Product Width 30"